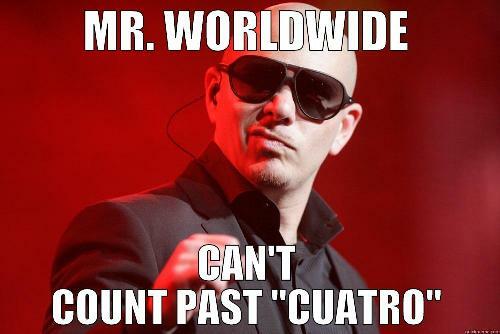 If you learned the basics of counting Spanish numbers from Pitbull, prepare to be amazed. There are more numbers than “uno, dos, tres, cuatro” in Spanish. Oh, and dale isn’t a number. And you’ve probably realized by now, that Spanish counting does not involve saying five—or cinco—twice. So what does it involve? And why should you care? All in good time, people. Let’s start with the “why?” question. Learning to count is one of first things that people learn in any language, be it their first, third or twentieth, which kind of suggests it’s important. And, of course, knowing how to say numbers helps in many basic situations. You’ll need to know the numbers to buy things, unless you rely on the universal system of pointing, nodding and smiling. However, that usually results in you having no idea how much you’re paying for anything. You’ll also need to know the numbers to talk about some of the other basic stuff you learned in beginner Spanish class, like your age, your address and your phone number. Numbers also tend to pop up in places that you might not expect. The number of a bus, for example, a train platform or your place in a line. Just trust us, you definitely need to get your numbers right. And though you might think counting in Spanish is easy, there are a few tricky little rules you need to get your head around if you want to avoid making mistakes. Let’s Start Counting in Spanish! Now that you understand the importance of these number-oriented Spanish lessons, I’ve got all the information you need to get started learning Spanish numbers and counting systems. Of course, we’ll start off with the basics. 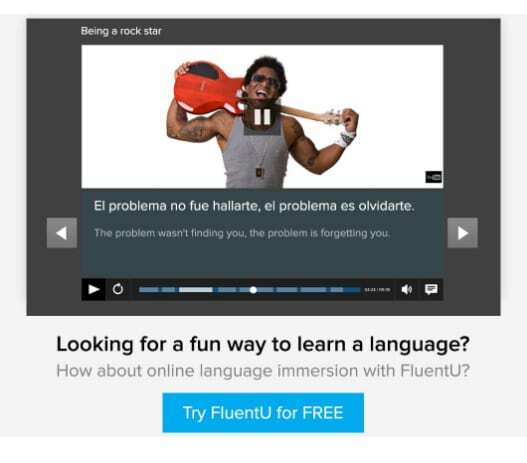 If you want some more help learning to count in Spanish, and you’d like to use slightly more reliable sources than our singer friends from the introduction, you can count on FluentU. 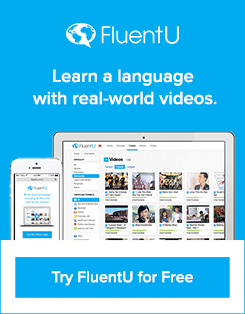 FluentU takes real-world videos—like movie trailers, news, inspiring talks and, yes, music videos—and turns them into personalized language learning lessons. Let’s start at the very beginning and count to veinte (20) in Spanish. Note the accent on dieciséis. If you’re not sure how to pronounce these numbers, this video sums it up pretty nicely. Also notice that dieciséis (16) is made up of diez (10) and seis (6), which together make 16. Clever, huh? This gives you a clue as to how to make the other two-digit numbers. First you just write out the base number (for example, 10, 20, 30, etc.). Next you write y (and) to serve as your connector, and then you write the second digit in the number (for example, 1, 2, 3, etc.). This also helps us in the next section. For the following set of numbers, follow the pattern I just showed you. To make 21, you’ll take veinte (20) and add uno (1). Bam! You’ve got it: veinte y uno. All put together, it’s spelled veintiuno. Like with dieciséis, the sound of the y mixes with the e at the end of veinte, making the correct spelling veintiuno rather than veinte y uno. Note the accents on veintidós, veintitrés and veintiséis which clue you in to their proper Spanish pronunciation. Here’s a video to help with pronunciation if you’re not sure how to proceed. Let’s keep rolling! Since you know the pattern for these 2-digit numbers now, all you need is the vocabulary for the big base numbers. Then you’ll assemble everything in-between following that pattern. And now you can make any number up to 100. To make numbers past 30, you have to write out the y. So 33 is treinta y tres. It is not treintaitres. Also note the 1-letter difference between sesenta (60) and setenta (70). This is one that continues to confuse people at even the advanced level (yes, I’m speaking for myself here), so it’s worth repeating over and over until you really get it. Once you’ve practiced that over and over again, try counting yourself to sleep every night in Spanish, counting your steps as you walk down the street in multiples of 100 or watching this video and enjoying its funky music, you’re ready to move onto bigger numbers. So if cien = 100, 101 must be cien y uno, right? Why? First of all, cien is only used to say 100 even. Second, there’s no y used because the y is only used to separate the tens from the ones (42 = cuarenta y dos) but not the 100s from the 10s (142 = ciento cuarenta y dos). So, following this pattern, 104 is ciento cuatro. 147 is ciento cuarenta y siete not ciento y cuarenta y siete. To put it another way, the y that you added in from 1-100 (16-99 for pedants) is still the same, but you don’t add another y to your number phrase when you get past 100. This can be a bit confusing, as in English we need the “and” to separate the hundreds from the tens. 154 is “one hundred and fifty four” in English, but in Spanish it’s “one hundred fifty and four” or ciento cincuenta y cuatro. You’ve got it! If not, try testing yourself on a few more and repeating over and over until you get it. To make 200, you just add 2 and 100. So you get doscientos. Note that you need to make your ciento plural by adding an s.
Beyond one thousand, what happens? You just add one other number as appropriate to signify how many thousands you have. So 2.000 is—you guessed it—dos mil. 3.006 would be tres mil seis (no y required after mil!) So, try to guess what 7.642 would be. Siete mil seiscientos cuarenta y dos. And if we go even bigger than that, how do you make 46.000? It’s just like in English: forty six thousand is cuarenta y seis mil. And how do you make 46.155? Take cuarenta y seis mil, add 155 (which, as you know, is ciento cincuenta y cinco) and you get cuarenta y seis mil, ciento ciencuenta y cinco. You can now use these rules to count up to a million! Try testing yourself if you’re not sure about counting this high in Spanish, or check out this video for a recap of the rules. For specific rules about millions, see this post. Notice anything funny about the numbers above? After mil, in Spanish we use a period to separate our numbers, instead of a comma like we use in English. So 100,000 in English becomes 100.000 – cien mil (an explanation of why it’s cien and not ciento is coming up). We’ll stick to the Spanish way of writing these numbers from now on to avoid confusion. So now it’s time for the million-dollar question! How do you make a million? Money-making schemes aside, un millón is 1.000.000 (note the use of un, unlike mil). 4.000.000 is cuatro millones (note how millones becomes plural and drops the accent). 4.000.800 is cuatro milliones, ochocientos. How about something crazy like 6.986.410? Did you say? Seis millones, novecientos ochenta y seis mil, cuatrocientos diez. You’ve got it! If not, try starting from the 100s and working backwards. Well, that depends which system you’re using as there’s some debate about how many a billion actually is. In the traditional U.K. system (also used in Spain and Spanish-speaking Latin American countries), a million millions (1.000.000.000.000) is un billón in Spanish. In the traditional U.S. system (also used by Brazil and Russia), a billion is a more modest thousand million (1.000.000.000) and is mil millones in Spanish. It really is easier to become a billionaire in the United States. Another term you might come across is un millardo, which is the same as the U.S. billion (1.000.000.000). Officially, the whole world has now decided to go with the U.S. system, but in practice, how many millions there are in a billion varies wherever you are. If you need to be precise, it might be worth asking, ¿Cuánto es un billón? Remember when I said I would tell you why it’s cien mil and not ciento mil? Has it been bugging you ever since? What’s the difference between cien and ciento? Beyond hundreds, there are a few more exceptions to be wary of. We also have a special situation when we talk about numbers that end in uno. As we know, 1 = uno, but we don’t say: uno mesa as you might expect. First of all, mesa (table) is feminine, so we need to make our adjective (the number in this case) feminine. So it’s una mesa not uno mesa. When our noun is masculine, uno becomes un. So, for example, it’s un espejo (one mirror). We also shorten other numbers that end in uno to ún (note the accent). So it’s veintiún espejos because espejos is masculine. It would be veintiuna mesas, because mesas is feminine. When our number ends in ientos (seiscientos, for example), we also need to make sure that our adjective (the number) agrees with our noun (the thing we are counting). As long as you treat the number like you would any other adjective when you’re counting, you won’t run into any problems. To read more about making adjectives agree, read this post. So there you have it, it’s as easy as one, two, three, or uno, dos, tres. For an extra challenge…try writing out the biggest number you can think of and working out what it is in Spanish. Then find someone to impress with your new skills!